Rockwell lathe. What is this worth? Hi guys. 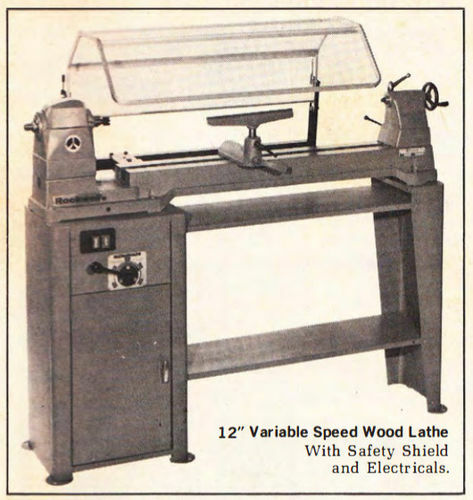 I am interested in getting a wood lathe. It is actually for my wife since she would like to do some wood turning. Neither one of us has done much as far as woodturning goes. That being said, I have been building furniture and other woodworking projects for the last 30+ years. Fairly accomplished in that aspect. We currently have a small-ish Craptsman lathe that we haven’t even used. It is an older one. I told her that something like this Rockwell would be good because of the mass and the easy speed adjustment. 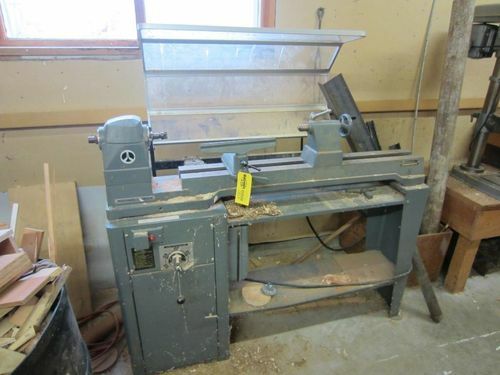 So, what is a lathe like this worth? Troubled by “works,” if would let you see and hear it run would certainly feel better about making an offer. If have the skills to make repairs (belt & bearing changes and adjusting reeves drive) even $425 not bad considering what a new midi lathe cost today. Ok thanks guys. I definately have the ability to make repairs to bearings and such since my other hobby is machining (lathe, large vertical mill, TIG welder, presses, etc etc). As you mentioned Nubsnstubs, there are many days left so it will certainly go up in price. Lets assume it runs with no issues, then what is it worth. Should I stop at $600, $800 or what would be a “going” rate? Is there anywhere near by where she can take a turning class. It might be good for her to get an idea what she would like to turn. I can’t tell you what you can spend as that’s up to you. I have seen prices as high as $1100 for a 46-450, which this looks a little like. There is no way to know what it actually is, and with the Rockwell symbol being the peace sign, it’s a lot newer than the 46-450 I have which I saw that had the $1100 price. If you could get the model number, you could look up others of that model and see what they are selling for. Know this, it’s going to be a little noisy because of the stand it’s on. So, if you can get someone to let you run it, just know before hand about the rumbling noise it most likely will make. It’s not bearing noise…... You’ll know that when you hear it. Not that it needs to be said, and I am being very serious…... but Jerry is the “go to” guy for lathes. He has given me some great advice in the past…..you can bank on what he says. I believe somewhere in Santa Rosa, or in that area. I have a friend in Novato, let me see if he remembers. It would be a drive for you but you could make a vacation out of it. If I were to guess, I’d say it was a catalog 46-542 (3/4hp single phase motor w/24v LVC starter). 46-543 if three phase. As to what it’s worth… that depends on a lot of variables that only you can decide. I have a similar model. It is a beast. It appears to set up primarily for spindle turning. If her interests initially are smaller things and bowls—and learning the basics of woodturning, a much smaller lathe would make sense. Many woodturners now prefer chucks, which could add a couple hundred dollars to the starting investment. Locally (Ventura) we have a woodturning club that has loaner lathes, and often members upgrade their machines and offer very good prices on their old machines. Excellent info there Mr. Unix. I am in Wisconsin so going to California to either buy a lathe or taking classes are not really an option. There is actually a wood-turning guild in Chippewa falls which is slightly less than an hour away (near where this lathe is). There a few guys around here that turn, of which I might see tomorrow night at our monthly wookworking club meeting (Silver Sliver Pickers Club). Say that fast 3 times after a beer :) Mark Pulma is in our club and I know he does some nice work with his turnings. Well you have 5 days to answer the question of what do your wife and you want to turn? Something grabbed her interest. A 12” swing with 3/4 hp will do decent sized bowls (~10” and the outboard spindle could allow a little larger, hollow forms about 10” dia if you trim well, and most any spindle turning. Low speed might be an issue for finishing/sanding larger dia pieces – look up the lowest rpm. The motor will be a bit weak at larger dia, just means take lighter cuts, it will work. Personally I wouldnt go much over where it is – I think there are some decent new midi lathes with vs in the $700-$800 range. Just thinking 50% of new price for old equipment. If you want the cheapest route to a similar lathe, look at the HF 34706, with coupon probably under $300. I learned on one and had it for 6 yrs, made some nice stuff with it. Sold it for $70 over what I paid for it with added shelves and ~$100 in tool rests that were no good for my new lathe. Moke, I’m not really a ‘go to’ guy on lathes. I only know my lathes from experiences with them. Some bad, but mostly all good. I had a Delta 1460 up until a month ago. It’s now taken up residence near Branson, Missouri. Don’t forget to factor in the buyers fee plus the 3.5% convenience fee if you want to pay with a credit card. I couldn’t figure out what the buyers fee is on this item but I would expect at least 10%. There are obviously lots of good reports above on this lathe but as a beginner, your wife might be happier with something like a new Nova Comet II for about the same amount or a good used Jet midi lathe off of Craig’s List for example. There won’t be any surprises and you won’t have to break your back getting it home. And don’t forget to factor in all of the other costs of getting into turning. A good set of chisels, face plates, centers, a chuck, etc. (I don’t see a live center in the auction pictures.) It will depend somewhat on what she wants to turn but by the time you get a full set of tools, it could double a $400+ investment. You don’t need all of that right away but at a minimum, you will need some good chisels and a faceplate and a way to sharpen the chisels. Sometimes the Craigs List stuff will come with some of the add ons so could be a better deal overall. This auction appears not have any of that. So.. The lathe went for $580. I did not buy it. Have to many other expenditures going on for my metalworking hobby at the moment. I felt that $580 was plenty high too.